Minsky is Open Source software: you can download the source code and compile it yourself if you wish. But version 2.11 is the last version for which we'll post PC and Apple executables on SourceForge or Github. In future, compiles of new releases will be posted on blog entries here (as well as on Prof Steve Keen's Patreon page). Our motivation is twofold: to raise development funds, and to build a community of users. 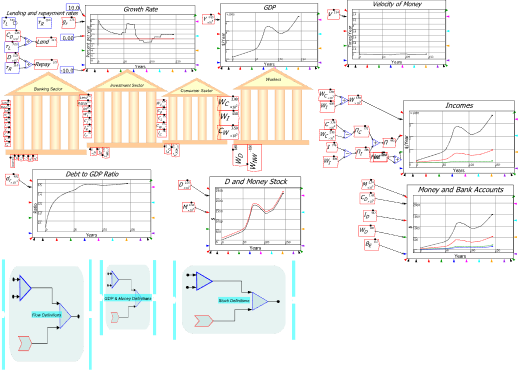 We developed Minsky to bring system dynamics modelling to economics (and to enable the analysis of banks, debt and money in macroeconomics, issues that mainstream economists completely ignore!). 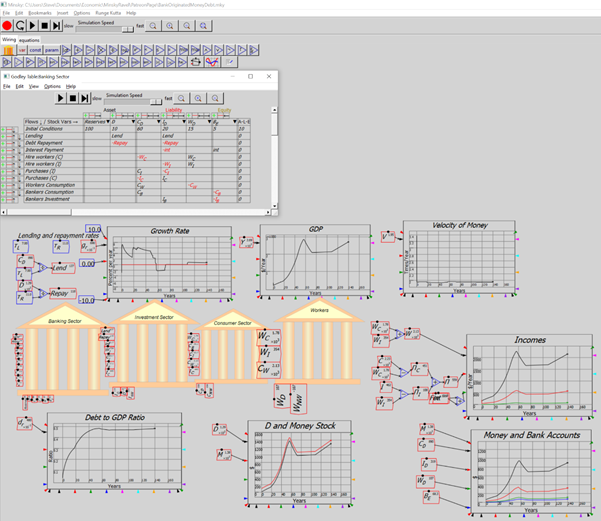 Minsky extends the "flowchart" paradigm used by all other system dynamics programs with its unique feature of Godley Tables: double-entry bookkeeping tables that make it easy to model financial flows, and to ensure stock-flow consistency in modelling. Minsky has never received funding from formal government research funding bodies. The referees for these organizations are almost exclusively mainstream ("Neoclassical") economists, who persist in using outmoded equilibrium-based techniques ("Real Business Cycle" & "Dynamic Stochastic General Equilibrium")--and don't comprehend that "equilibrium dynamics" is an oxymoron. Our funding to date has come from non-government sources: the Institute for New Economic Thinking gave $128,000 in 2011, a Kickstarter campaign raised $78,000 in 2012/3, Kingston University London gave a £20,000 grant in 2017 when Steve was a Professor there, and Steve and some of his supporters have made personal donations totaling about $50,000 over the years. Russell, Minsky's primary coder, is a freelance programmer rather than an academic, so we have to raise money to get Minsky developed: it's a labour of love for him, but he can't do it for free (his family would object!). Your contributions here, even just $1 a month--even just once, after which you can delete the monthly pledge--will help keep Russell working on developing Minsky. We also want to develop a user community for Minsky. If you sign up here, you can reach out to everyone else who's using Minsky to get instructions on how to use it (our Help File is pretty basic: we haven't had enough funding to pay for decent documentation), to exchange ideas with advanced users, share models, and so on. We hope that one day, in the not too distant future, Minsky will start being used for everything from economic modelling for governments, corporations, unions and community groups, to business consultation as well. If you're a member here, we can let you know when such opportunities arise. Minsky exports a model's equations in the mathematical formatting language LaTeX, making it easy to document a model (and it exports to Matlab as well). It's been used to simulate classic models of complex systems like the Lorenz equations, to model the Portuguese and Polish economies, to simulate and help understand shadow banking, to model the debt and credit dynamics that caused the Great Depression and the Great Recession, and to explain why the economic textbook models of banking are so wrong, as both the Bank of England and the Bundesbank have confirmed. We love Minsky, and we love even more what we know it can become over time. Economics has been stuck in an outdated equilibrium paradigm ever since 1870, and 50 years after dynamic, non-equilibrium modelling became possible on computers, mainstream economists still aggressively defend their "let's assume a can-opener" equilibrium methodology. In the first release coming here (version 2.12), adding some panache to our plots: formatting plot lines (weight, colour, patterns); resizable plot labels; exporting graphs for publication purposes; and running a simulation in reverse as well as forwards. Improvements require programming (and user-feedback), programming takes time, and a programmer's time costs money. You can help by signing up here, in return for the latest executables for both Windows and Apple PCs. As little as $1 a month will give you access to the latest version, and if you want to turbocharge Minsky's development, you can give more. This page will initially pay for Russell's programming time, and ultimately for a programming team. We want Russ to be able to spend at least 10 hours a month on coding Minsky, to remain on top of its code base, to remove bugs found by users, and to occasionally add features (our first goal). With sufficient funding, he can afford to spend up to 80 hours a month on Minsky (our second goal: as a freelancer, Russ has to keep the rest of his time free for other projects). As a third goal, we will hire a young coder to work full-time on bug hunting and development in areas that don't require Russ's knowledge of high performance computing projects (Russell was the Director of the High Performance Computing laboratory for the Universities of Sydney and New South Wales from 1997 till 2005). So if you want to help develop an already very powerful system dynamics program, and especially if you want to use Minsky in your own economic and complex systems/mathematics work, please sign up for as little as $1/month, download Minsky, and help us drag economics into the 21st century. Access to compiled Windows and Mac executables for every future release of Minsky. Membership of a community where you can exchange ideas, report bugs, and give feedback to Minsky's developers. The same as Minsky Users, but no need to provide your address. We're trying to build a user community for Minsky, which isn't possible from SourceForge, since all downloads there are anonymous. But if you want to remain anonymous, this is the tier for you. You can also delete your pledge after the initial sign-up too if you wish--we're cool with that. The same applies to all other pledge levels, so if you want just want to check Minsky out , you can do so with just a one-off contribution. The same as Minsky User, plus the knowledge that you're helping us to build Minsky more quickly. The same as Minsky Users, plus the knowledge that you're helping us to build Minsky very quickly. Every ten Developers help pay for one hour of Russell's programming time per month. The same as Minsky Users, plus the knowledge that you're helping us to build Minsky really quickly. Every month, your contribution enables 15 minutes of development time. The same as Minsky User, plus the knowledge that you're helping us to build Minsky at light speed. Every month, your contribution enables 1 hour of development time. That's awesome! There's a limit of 80, because that's about the maximum number of hours that Russell can afford to devote to Minsky (a freelance developer needs a diversified portfolio of clients). We don't believe that Unicorns exist, but we're willing to be surprised. If you are one, and you're happy about that being known, we'll acknowledge your support in the "About" page in Minsky. $1,000 per month will allow Russell to devote 10 hours per month to programming Minsky. That'll keep him familiar with the code, allow bugs to be fixed, and occasional features to be added.